"The outcome of this Senate vote will impact the fight for Internet freedom for years to come." 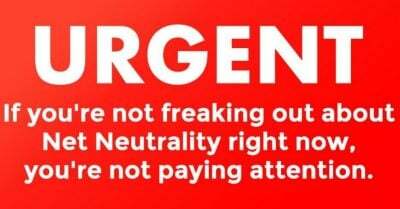 Internet freedom defenders warned on Tuesday that with only 24 hours left before the Senate votes to possibly nullify the Federal Communications Commission’s (FCC) repeal of net neutrality, the vote is expected to be “excruciatingly close”—and urged net neutrality supporters to flood Capitol Hill’s phone lines and demand that lawmakers protect the Open Internet. Several lawmakers including Sens. Lisa Murkowski (R-Alaska), John Kennedy (R-La. ), and Cory Gardner (R-Colo.) are currently on the fence, due to concerns over “retribution from Comcast’s and Verizon’s army of lobbyists,” according to the net neutrality advocacy group Fight for the Future. “We need to make it clear that they should be more afraid of us than they are of them. And we only have a few more hours to make a difference,” wrote the group in an email to its supporters. The latest call to action followed similar rallying cries in recent days, as senators who oppose the FCC’s December repeal of net neutrality rules have prepared to bring the Congressional Review Act (CRA) resolution to the senate floor for a vote. Passage of the resolution by the Senate and the House would offer a chance to void the Republican-controlled FCC’s 3-2 vote. The FCC’s decision was welcomed by internet service providers (ISPs) like Comcast and Verizon, which without net neutrality in place would be able to throttle traffic in order to charge content producers and web users for premium access or services. While powerful telecom companies would be the sole beneficiaries of the FCC’s rule change, surveys have consistently showed widespread and bipartisan backing for the net neutrality protections, with a recent poll showing 83 percent of Americans in support. The group urged supporters to call key senators in Utah, Florida, Nevada, Arizona, and California, as well as Murkowski, Gardner, and Kennedy, to ensure that the Democratic caucus of 49 senators have the Republican support they need to pass the CRA. Sen. Susan Collins (R-Maine) is the only Republican who has pledged to support net neutrality. “The next 24 hours could make or break this fight…This is a moment where the entire Internet needs to go all-in for net neutrality,” wrote Greer.